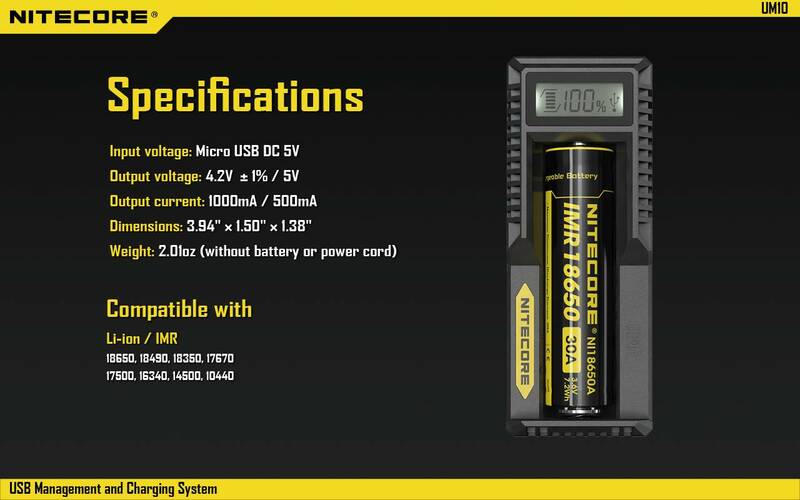 Compatible Battery Types: Li-ion/IMR: 18650, 18490, 18350, 17670, 17500, 16340 (RCR123), 14500, 10440 (Compatible with 3.6V or 3.7V cylinder rechargeable Li-ion battery). Connecting: Unwind the USB cable, lift the rear panel and draw out the cable as instructed. Plug one end of the included USB cable to the UM10’s input port and the other end to a power supply (adapter, PC or other standard USB output port). 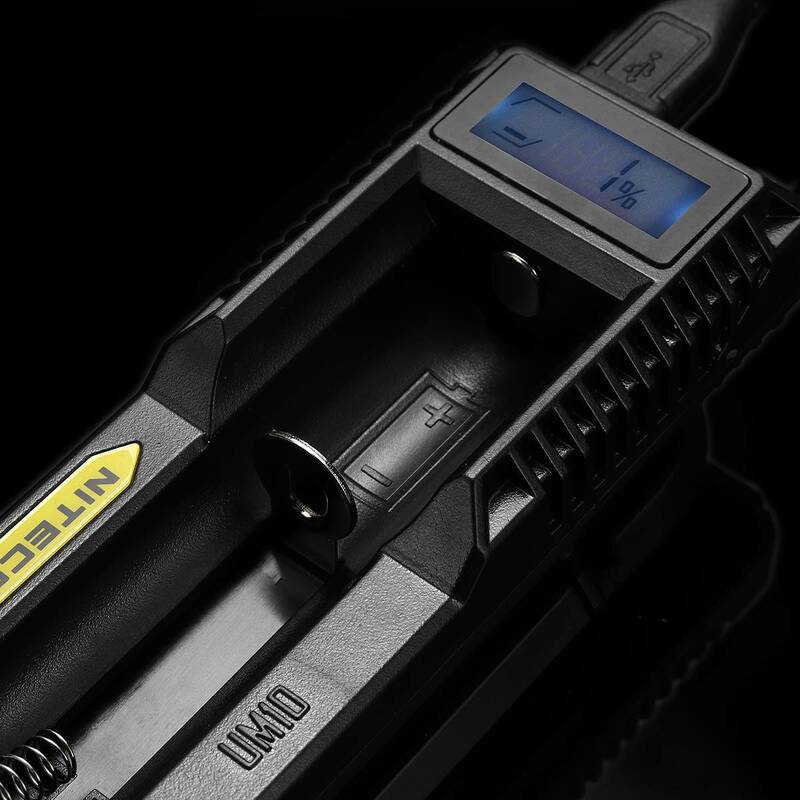 Upon powering up, the UM10’s LCD will display the power level indicator (hollow) and battery percentage (0%). Inserting Batteries: Insert batteries as instructed. Incorrectly inserted batteries will prevent the UM10 from functioning. Battery Test: After battery installation, the UM10 will run a quick battery test before charging. 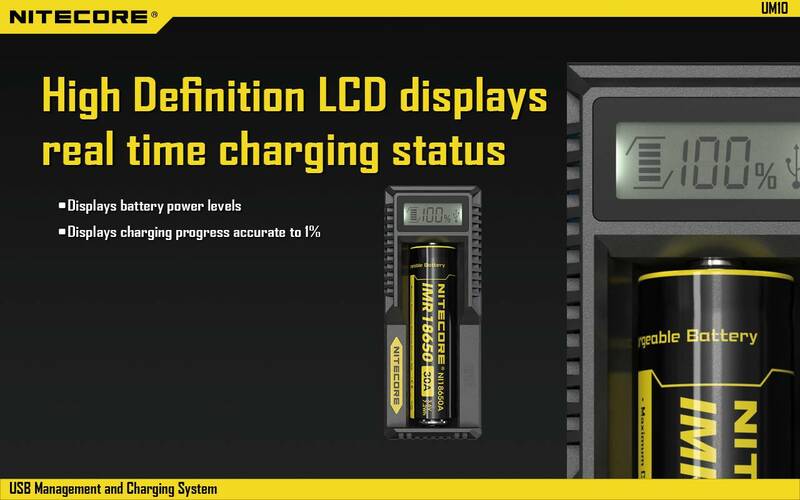 If a problem is detected (for example the batteries are installed backwards), the UM10 will stop charging and display “EE” on the LCD to notify the user. 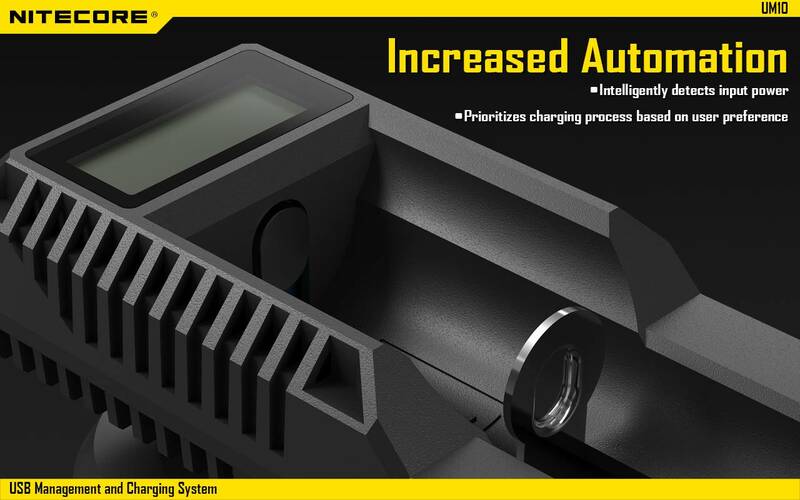 Charging: During the charging process, charging current will adjust automatically based on the detected battery type, power level and internal battery resistance. 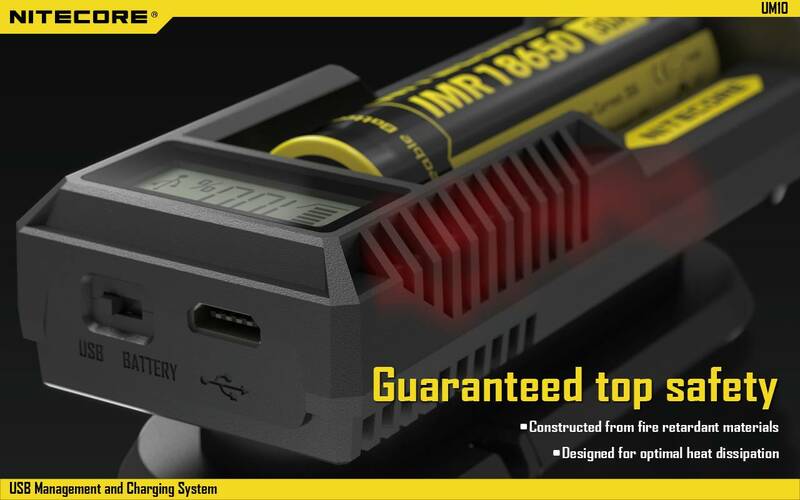 For example, when charging batteries of smaller capacities such as 14500 and 16340, charging current will automatically be set to 500mA, ensuring safe use and preserving battery longevity. Charging Progress: The UM10 will indicate battery status and charging progress. When the battery is fully charged, 5 power level indicator bars and “100%” will illuminate steadily on the LCD display. Lift the rear panel and plug an USB cable to the charging port underneath. Connect the other terminal of the USB cable with an external device that needs to be powered / recharged. 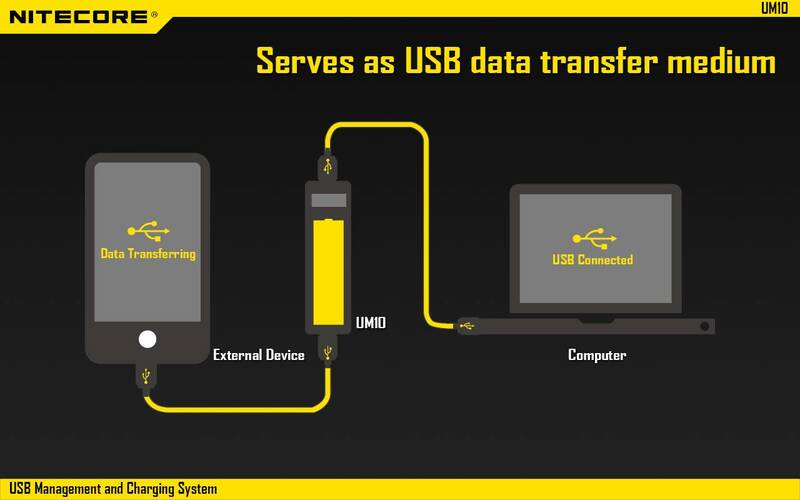 USB will start flashing on the LCD to indicate the UM10 is connected with a USB cable. After the device is fully charged, the USB icon stops flashing and remains on constantly. 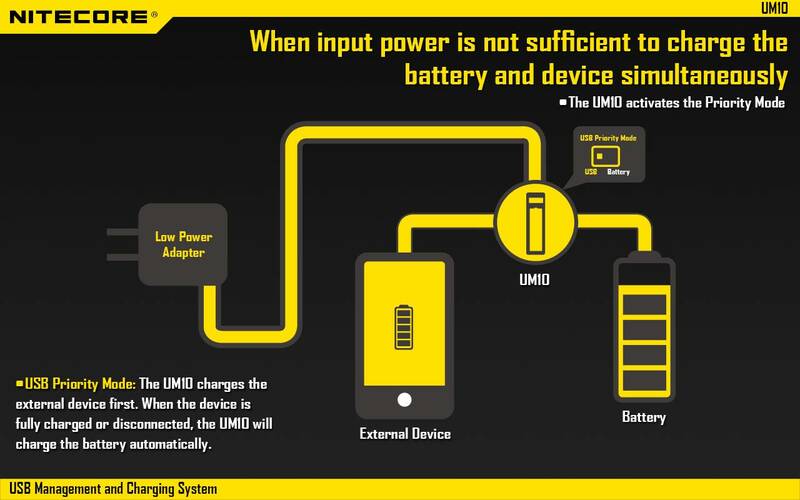 When there is a power deficit for the UM10 to charge both the battery and USB device simultaneously, the UM10 will prioritize the charging of the battery or the device following the user’s reference. When the top switch is set to BATTERY, battery priority mode will be activated. 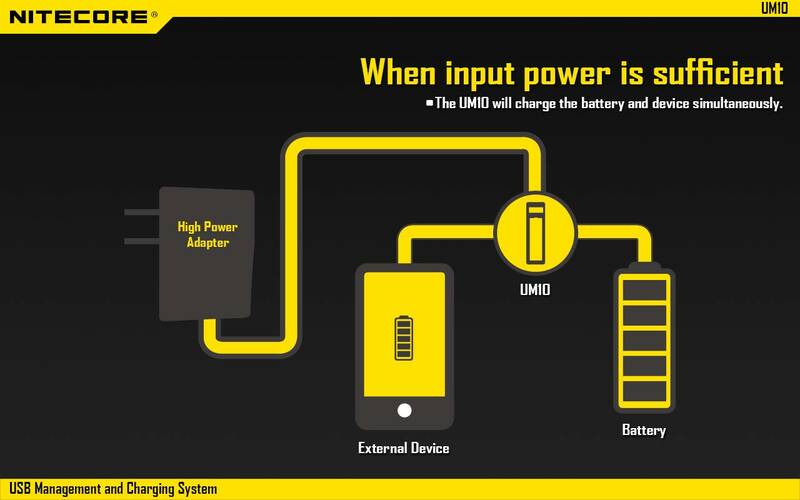 In this mode, the UM10 will charge the battery first. 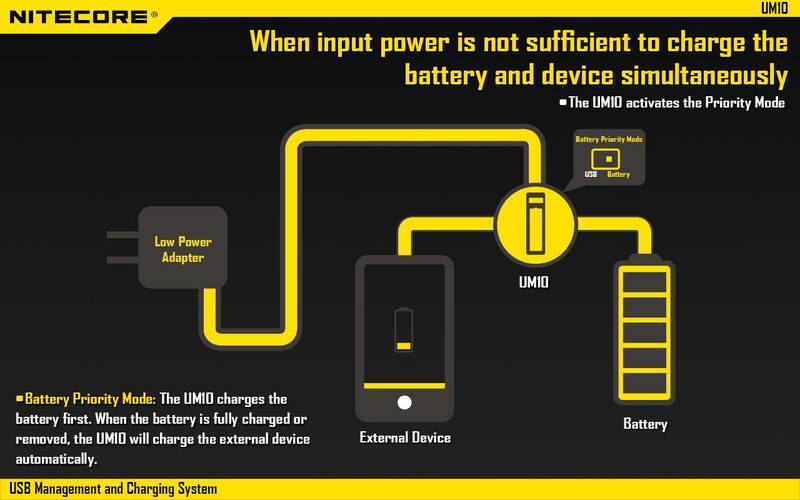 When battery is fully charged or removed, the UM10 will then charge / power the USB device automatically. When the top switch is set to USB, USB priority mode will be activated. In this mode, the UM10 will charge / power the USB device first. 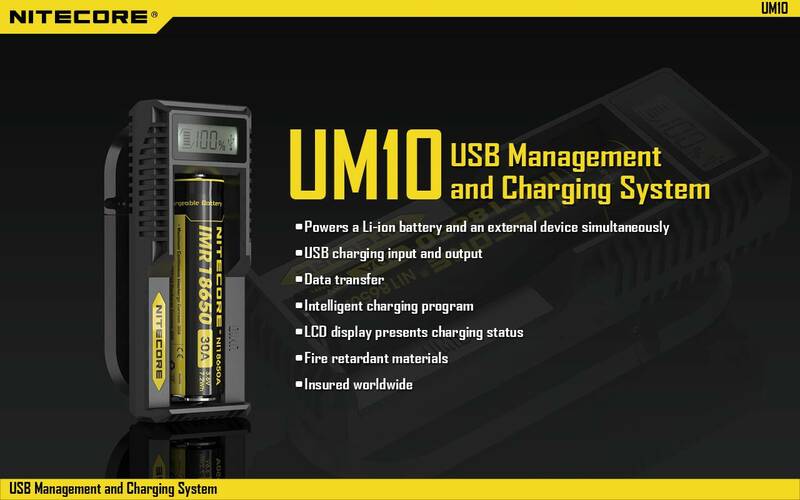 When the USB device is fully charged or disconnected, the UM10 will charge the battery automatically. 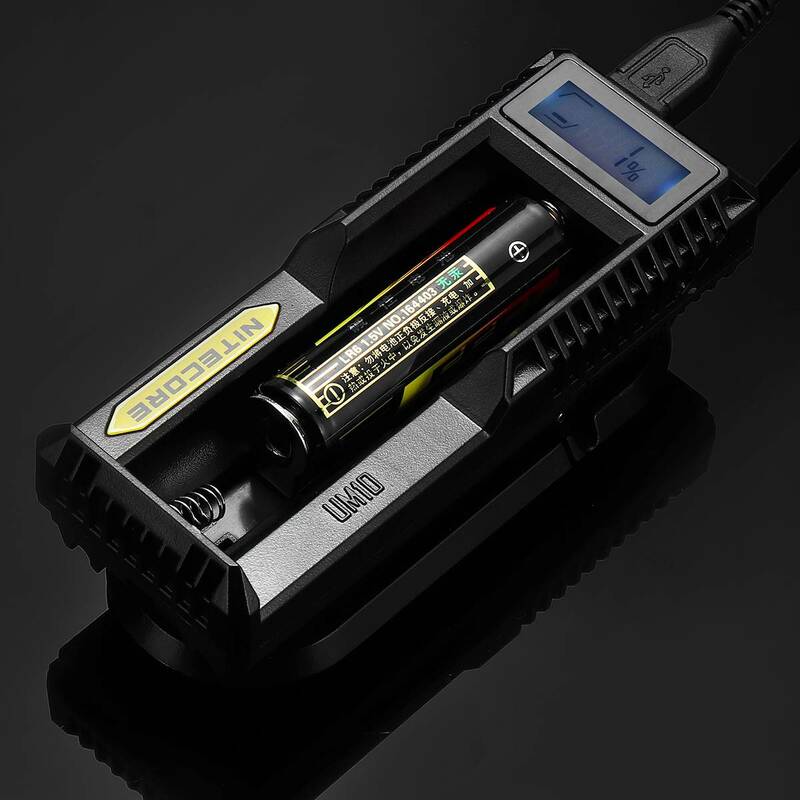 The UM10 is capable of activating over discharged protected Li-ion batteries. After battery installation, the UM10 will test and activate the batteries before charging. Batteries detected as damaged cannot be activated by the UM10 and “EE” will be displayed on the LCD to indicate an error. 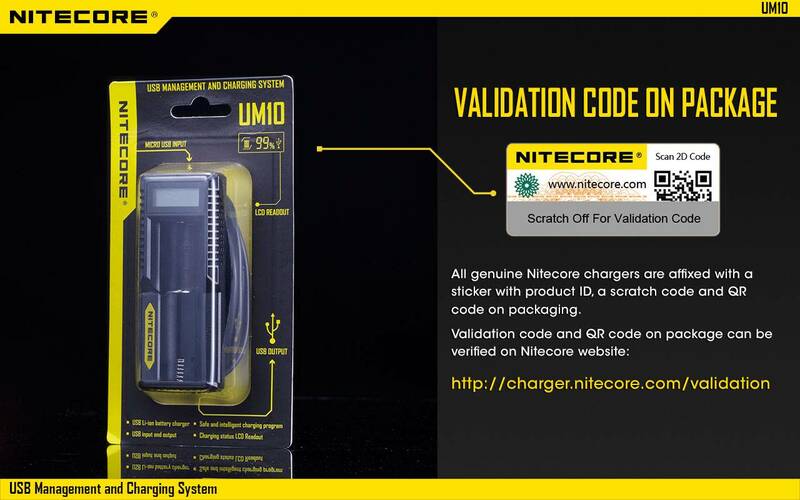 NOTE: Nitecore does not recommend charging zero volt (0V) (over discharged) unprotected Li-ion batteries with the UM10 and doing so can result in battery leakage fire, or explosion. 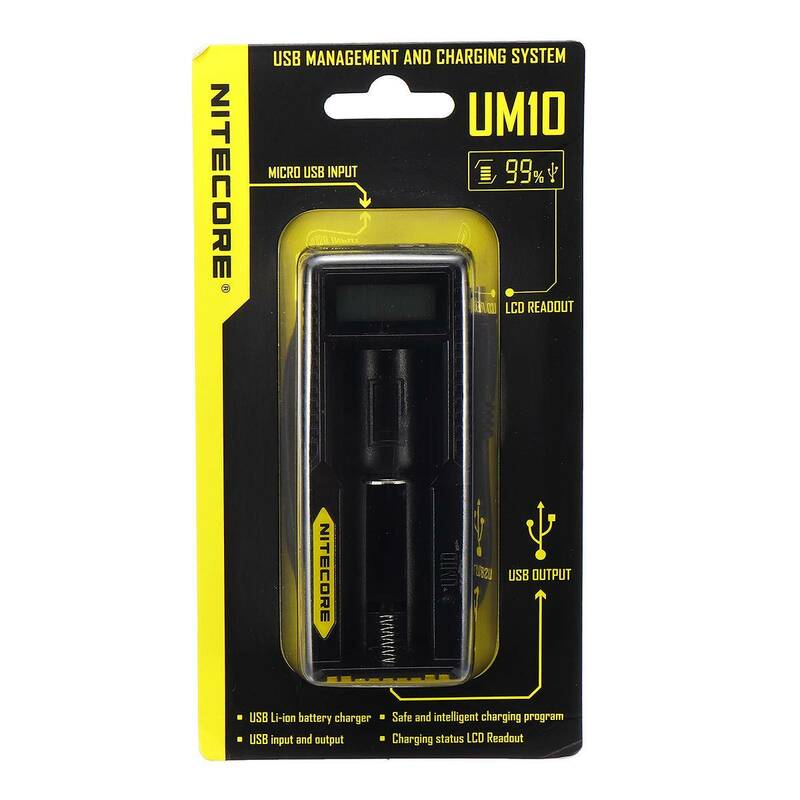 Nitecore recommends using only quality USB adapters with the UM10. Using poor quality adaptors may result in the LCD displaying “EE” to indicate an error. 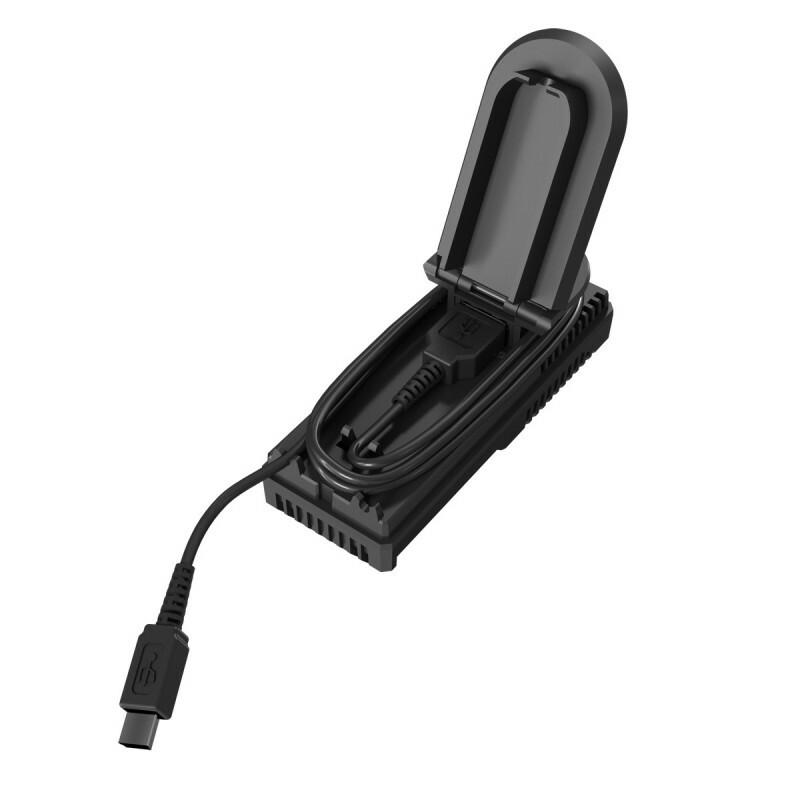 The charger is restricted to charging Li-ion, IMR rechargeable batteries only. Never use the charger with other types of batteries as this could result in battery explosion, cracking or leaking, causing property damage and/or personal injury. 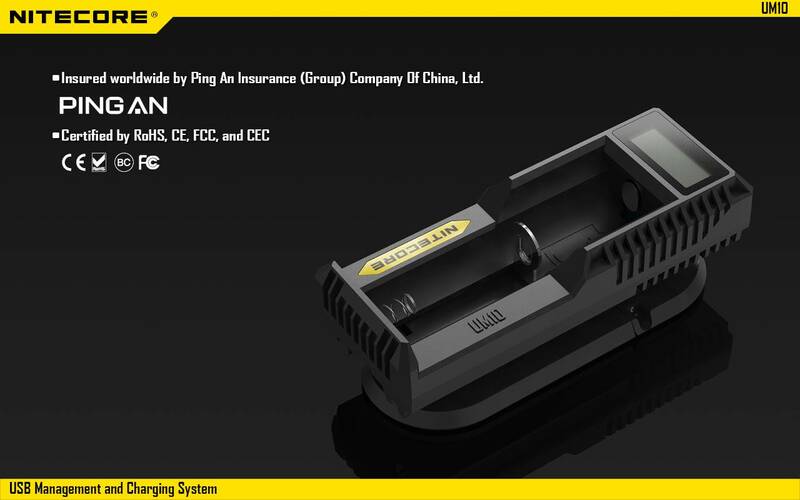 The safe operation temperature for the charger is between -10 to 40°C, and the safe storage temperature is -20 to 60°C. Do not use the charger to charge other unspecified batteries as they may leak or burst, causing personal injury and damage. 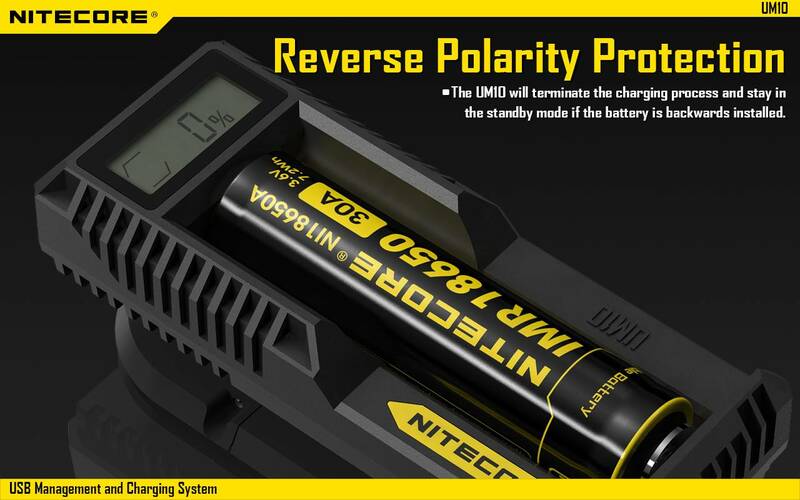 Observe polarity diagrams located on the charger. Always place the battery cells with positive tip facing the top. Never leave the charger unattended when it is connected to power. If any malfunction is found, terminate the process at once and refer to the operation manual. The charger is for use of adults above 18 years old. Children under this age must be supervised by an adult when using the charger. Please make sure the correct program and settings are chosen and set. Incorrect program or setting may damage the charger or cause fire or explosion. Never attempt to charge primary cells such as Alkaline, Zinc-Carbon, Lithium, CR123A, CR2, or any other unsupported chemistry due to risk of explosion and fire. 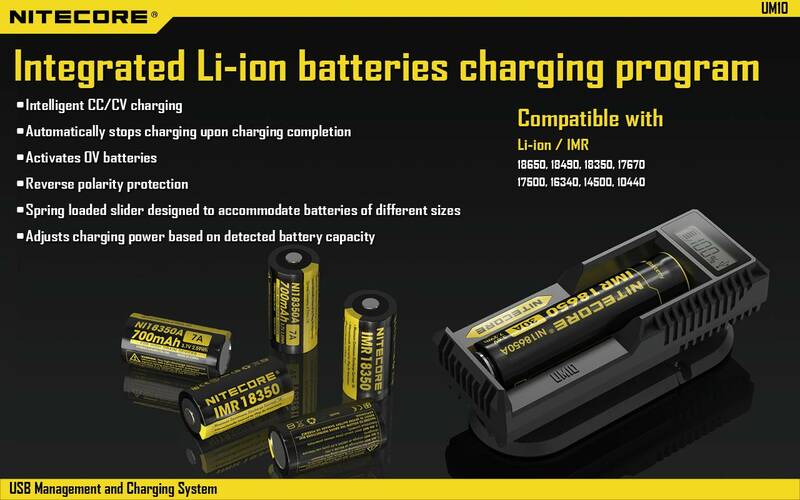 Do not charge a damaged IMR battery as doing so may lead to charger short-circuit or even explosion. 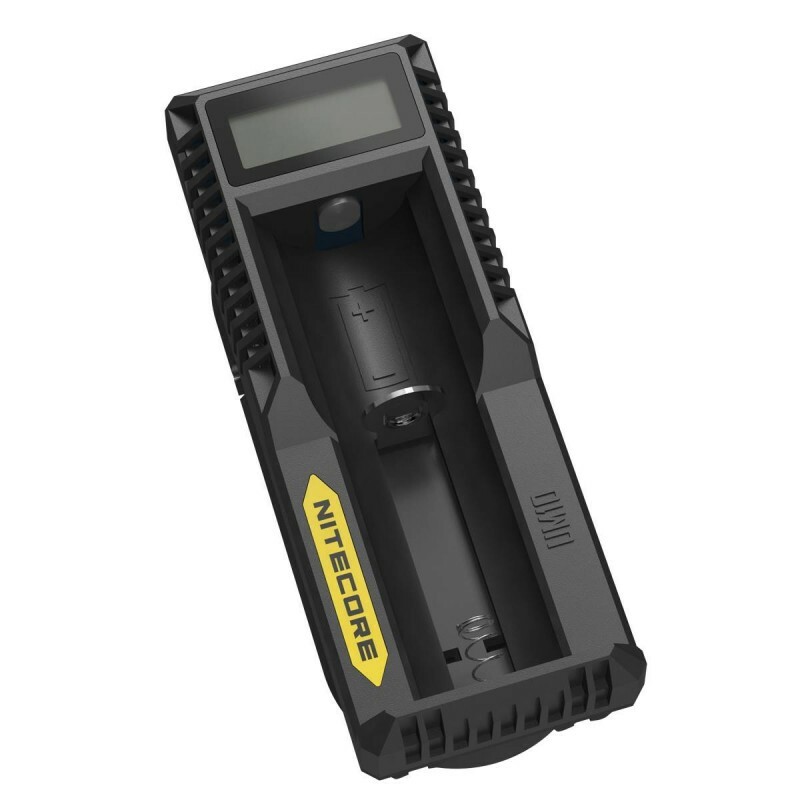 Never charge or discharge any battery having evidence of leakage, expansion/swelling, damaged outer wrapper or case, color-change or distortion. Do not expose the device to direct sunlight, heating devices, open flames; avoid extreme high or extreme low ambient temperatures and sudden temperature changes. Please operate the charger in a well-ventilated area. Do not operate or store it in damp area. Keep all the inflammable volatile substances away from operating area. Avoid mechanical vibration or shock as these may cause damage to the device. Do not short-circuit slots or other parts of the device. 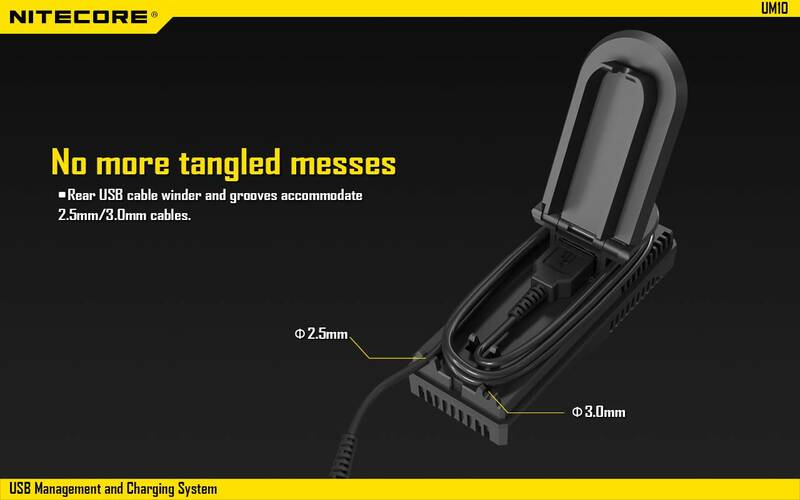 Do not allow metal wires or other conductive material into the charger. Do not touch hot surfaces. 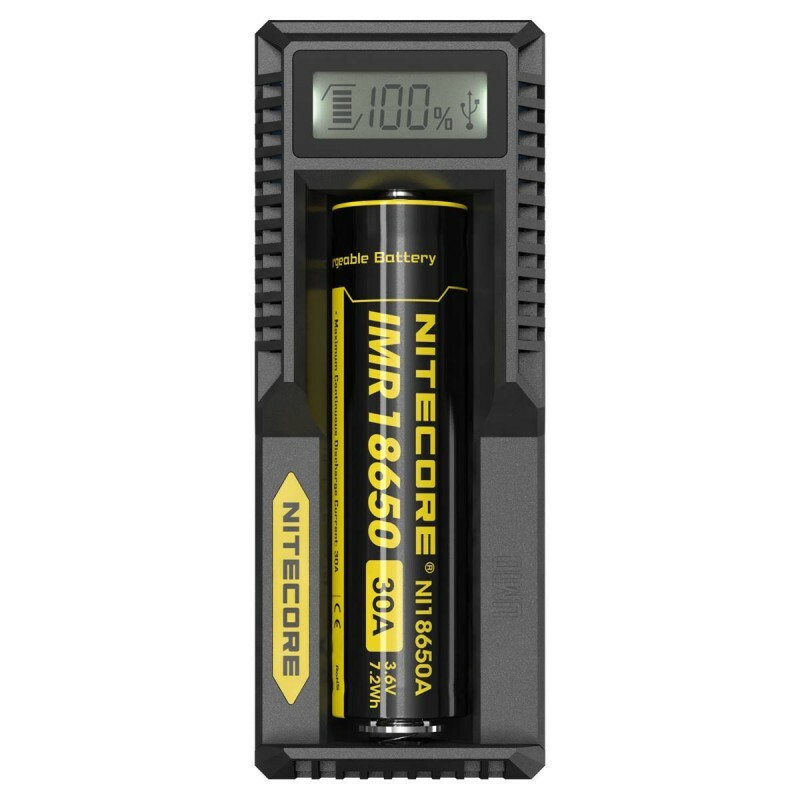 The rechargeable batteries or the device may become hot at full load or high power charging/discharging. Do not overcharge or over discharge batteries. Recharge drained batteries as soon as possible. Remove all batteries and unplug the charging unit from the power source when not in use. Opening, disassembling, modifying, tampering with the unit may invalidate its guarantee, check warranty terms. Do not misuse in any way. Use for intended purpose and function only. When using as a vape charger, please make sure the connections are not loose.